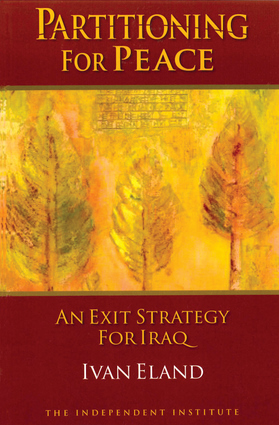 Combining a history of Iraq and its dominant sects with an acute awareness of the political machinations fomenting worldwide, this keen military analysis offers a practical exit strategy for U.S. armed forces in Iraq—partitioning, a unique strategy that has been successful in other chaotic political situations. Ivan Eland is a senior fellow and director of the Center on Peace and Liberty at The Independent Institute, a former director of defense policy studies at the Cato Institute, and a former principal defense analyst with the Congressional Budget Office. He is the author of The Empire Has No Clothes and Recarving Rushmore. His work has been featured in numerous publications, including the Chicago Tribune, Northwestern Journal of International Affairs, and The Washington Post, and on television programs such as ABC's World New Tonight, CNN's Crossfire, and Fox News. He lives in Washington, DC.